OS grid reference: SS 1417 9664. The holy island of Caldey (Ynys Pyr) lies about 2 miles south of Giltar Point, Tenby, across the strait known as Caldey Sound. The island has been called ‘A Cradle of Celtic Christianity’ since it’s foundation in c540 AD. Caldey is thought to be named after a Viking chieftain called Caldeye. The island is one and a half miles long and one mile wide. A celtic monastery was in existance here from the early 6th century, then in 1113 Cistercian monks founded a priory here but they were dependant on the abbey of St Dogmaels and this foundation, in it’s inhospitable position along with funding problems, meant that it was always in a poor state of repair and existance. But it did survive, in one way or another, until the dissolution in 1536. More recently, in 1923 Cistercian (Trappist) monks from Chimay in Belgium settled on the island and today they remain a major part of a thriving monastic community. There are three churches on the island, one of which, the old priory church (St Illtud’s) houses a 6th century stone ‘The Caldey Stone’ which has an Ogham inscription along with a Latin inscription and crosses. The first abbot of Caldey was St Pyr (Piro), but was he the founder? According to legend, Pyr got drunk one night and fell into the monastery well through drinking to much homemade wine, or beer! He was succeeded as abbot by St Samson (c550) who had travelled here from Llanilltud Fawr, south Glamorgan, the monastic college of St Illtud. However, it seems Samson did not stay long on Caldey because he failed to improve the bad habits of the monks. St Samson travelled to Ireland. The thinking is that it was St Illtud who then succeeded St Samson as abbot, but there is uncertainty because St Dubricius may have been here at about the same time. There are three churches on Caldey Island: St David’s, the old priory church (St Illtud’s) and the Abbey Church. St Illtud’s is a 13th century foundation that is famous for it’s leaning tower and 50 foot high spire and, inside, it’s floor and walls are made of black pebbles from the shoreline, and a stained-glass window shows St Illtud as a knight of King Arthur’s court. 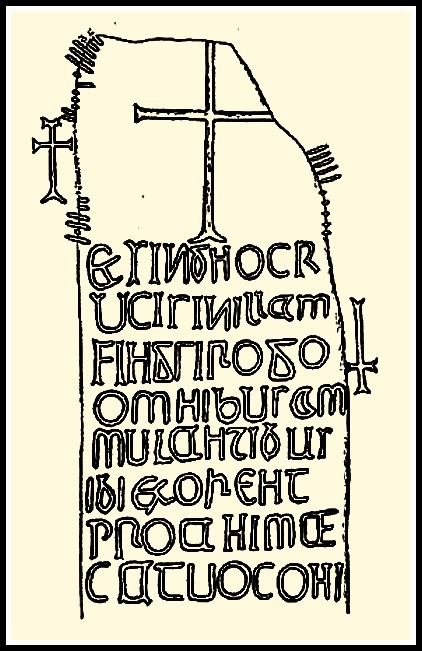 In the sanctuary of the old priory church, also called St Illtud’s, there is a 1.7 metre high 6th century Ogham inscribed stone known as The Caldey Stone. At the top right and left edges are incomplete notched inscriptions in memory of MAGLIA DUBRACUNAS – the servant of Dubricius or Dubracunas, the son of. The Latin inscription, carved in the 9th century, is on the front face and is taken to be ET SINGNOCR CRUSIN ILLAM FINGSI ROGO OMNIBU AMMULANTIBUS IBI EXORENT PRO ANIMAE CATUOCONI – ‘And by the sign of the cross which I have provided upon that stone, I ask all who walk there that they pray for the soul of Catuocunus’. Cutuocunus is probably to be identified with Cadwgan. Also, the stone has four Latin-style crosses on all four sides. St David’s is a small church close to the lily pond and seashore. The walls are 3 foot thick, a fact which could mean the building is of Celtic origins, but more likely it is a medieval foundation. There are wood carvings depicting the Oberammergau passion plays in Bavaria. Finally, the Abbey Church was built in the Romanesque style with local, Caldey limestone. There are some nice statues in here of St Bernard of Clairvaux, Our Lady, St Illtyd and St Aelred, abbot of Rievaulx in Yorkshire. The choir-stalls date from the 15th century and are made of oak. Clearly, this church is still in use as a monastery church with a cloister-like surround and refectory and kitchen to the west, while on the opposite sides, dormitories and abbey office buildings. On the cliffs to the south of the abbey is a 12th century watchtower that is now used as a chapel by the monks. At the north-eastern side of the island near Den Point are Nanna’s Cave, Potters Cave, Ogof-yr-Ychen and Ogof-yr-Benlog caves where prehistoric artefacts have been excavated. Human and animal bones have been found from as far back as the Palaeolithic and Mesolithic ages right up to more recent, post Roman times. Categories: Caldey Island, Holy Islands | Tags: Caldey Island in Pembrokeshire Wales | Permalink.